Choose from one color or two-tone designs from 15 vibrant colors and the perforation on top & bottom, sides, or all around, it’s up to you! Get the hottest trend in steering wheel styling and protection with the WheelSkins EuroPerf Perforated Leather Steering Wheel Covers! They will give your vehicle the look and feel of the world’s finest cars in less than an hour. Boasting handmade craftsmanship of 100% genuine top grain leather, these steering wheel covers guarantee the most precise fit and luxurious feel your money can buy. 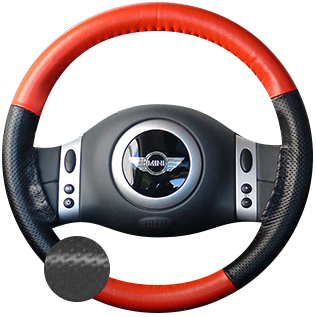 WheelSkins EuroPerf Perforated Leather Steering Wheel Covers are offered in one color or two tone designs, along with the choice of top, bottom, sides, or all around perforation, you decide. Get the best protection and style after an hour or less installation time using the nylon thread and leather needle kit. Best yet, all WheelSkins EuroPerf Perforated Leather Steering Wheel Covers are backed by a 90-day warranty. Nothing feels more luxurious than a steering wheel wrapped in premium leather. Think about it, you spend a lot of time touching the steering wheel. So, why not treat yourself to something that feels nice, looks nice, and improves your grip? Wheelskins is one of the premier makers of premium leather steering wheel covers and shifter boots in the United States. All of their steering wheel skins are hand made from premium-grade leather hides, and hand-dyed in a variety of stylish colors. A Wheel skins leather steering wheel cover is fairly easy to install, thanks to the supplied instructions, needles, and sturdy nylon thread. Unlike those $9.99 steering wheel covers from the auto parts store, a Wheelskins steering wheel cover fits much tighter to the wheel. And once you’ve got it laced up, it’ll stay put, just like a factory leather steering wheel. So go on and treat yourself to the luxury of a real leather steering wheel!